The process of recovering a ship or cargo after a shipwreck or other maritime casualty. "Salvor" redirects here. For the US salvage ship, see USNS Salvor (T-ARS-52). Marine salvage is the process of recovering a ship and its cargo after a shipwreck or other maritime casualty. Salvage may encompass towing, re-floating a vessel, or effecting repairs to a ship. Today, protecting the coastal environment from spillage of oil or other contaminants is a high priority. Before the invention of radio, salvage services would be given to a stricken vessel by any ship that happened to be passing by. Nowadays, most salvage is carried out by specialist salvage firms with dedicated crew and equipment. The legal significance of salvage is that a successful salvor is entitled to a reward, which is a proportion of the total value of the ship and its cargo. The amount of the award is determined subsequently at a "hearing on the merits" by a maritime court in accordance with Articles 13 and 14 of the International Salvage Convention of 1989. The common law concept of salvage was established by the English Admiralty Court, and is defined as "a voluntary successful service provided in order to save maritime property in danger at sea, entitling the salvor to a reward"; and this definition has been further refined by the 1989 Convention. Originally, a "successful" salvage was one where at least some of the ship or cargo was saved, otherwise the principle of "No Cure, No Pay" meant that the salvor would get nothing. In the 1970s, a number of marine casualties of single-skin-hull tankers led to serious oil spills. Such casualties were unattractive to salvors, so the Lloyd's Open Form (LOF) made provision that a salvor who acts to try to prevent environmental damage will be paid, even if unsuccessful. This Lloyd's initiative proved so advantageous that it was incorporated into the 1989 Convention. In 219 BC, the Chinese Emperor Qin Shihuang (r. 221–210 BC) assembled an expedition consisting of a thousand people for the salvage of the Nine Tripod Cauldrons. The tripods were considered important artifacts, Chinese legends credit a Xia dynasty emperor with their construction. The tripods were lost in Sishui River in present-day Anhui Province. The salvage attempt was ultimately unsuccessful. Carvings in Han Dynasty tombs depict the salvage attempt. In the 11th century AD, a successful underwater salvage operation in Song China (960–1279) would employ the use of buoyancy. The Chinese understood the concept of buoyancy by at least the 3rd century AD; the short-lived child prodigy Cao Chong (196–208) weighed a large elephant by placing it on a boat in a pond and measuring the rise of the water level, then matching this weight with a boat loaded with numerous heavy objects which could be measured separately. Between 1064 and 1067, the Puchin Bridge near Puchow, a floating bridge built some 350 years earlier across the Yellow River, was destroyed in a flood. This bridge was made of boats secured by iron chains which were attached to eight different cast iron statues located on each river bank, cast in the shape of recumbent oxen. The flood pulled the oxen from the sandy banks into the river, where they sunk to the bottom; after this loss, the local officials issued a proclamation for submission of ideas on how to recover the statues. The plan of the Buddhist monk Huaibing was accepted, which is described in the text Liang Chi Man Chih of 1192, "he used two huge boats filled with earth, cables from them being made fast to the oxen in the river bed (by the drivers). Hooks and a huge counterweight lever were also used. Then the earth in the boats was gradually taken away so that the boats floated much higher and the oxen were lifted off the river bottom." In the Early Modern Period, diving bells were often used for salvage work. In 1658, Albrecht von Treileben was contracted by King Gustavus Adolphus of Sweden to salvage the warship Vasa, which sank in Stockholm harbor on its maiden voyage in 1628. Between 1663-1665 von Treileben's divers were successful in raising most of the cannon, working from a diving bell. 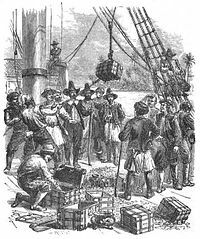 In 1687, Sir William Phipps used an inverted container to recover £200,000-worth of treasure from a Spanish ship sunk off the coast of San Domingo. The era of modern salvage operations was inaugurated with the development of the first surface supplied diving helmets by the inventors, Charles and John Deane and Augustus Siebe, in the 1830s. 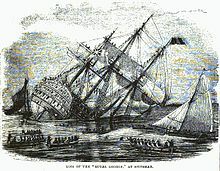 Royal George, a 100-gun first-rate ship of the line of the Royal Navy, sank undergoing routine maintenance work in 1782, and the Deane brothers were commissioned to perform salvage work on the wreck. Using their new air-pumped diving helmets, they managed to recover about two dozen cannons. Following on from this success, Colonel of the Royal Engineers Charles Pasley commenced the first large scale salvage operation in 1839. His plan was to break up the wreck of Royal George with gunpowder charges and then salvage as much as possible using divers. Pasley's diving salvage operation set many diving milestones, including the first recorded use of the buddy system in diving, when he ordered that his divers operate in pairs. In addition, the first emergency swimming ascent was made by a diver after his air line became tangled and he had to cut it free. A less fortunate milestone was the first medical account of a diver squeeze suffered by a Private Williams: the early diving helmets used had no non-return valves; this meant that if a hose became severed, the high-pressure air around the diver's head rapidly evacuated the helmet causing tremendous negative pressure that caused extreme and sometimes life-threatening effects. At the British Association for the Advancement of Science meeting in 1842, Sir John Richardson described the diving apparatus and treatment of diver Roderick Cameron following an injury that occurred on 14 October 1841 during the salvage operations. Pasley recovered 12 more guns in 1839, 11 more in 1840, and 6 in 1841. In 1842 he recovered only one iron 12-pounder because he ordered the divers to concentrate on removing the hull timbers rather than search for guns. Other items recovered, in 1840, included the surgeon's brass instruments, silk garments of satin weave 'of which the silk was perfect', and pieces of leather; but no woollen clothing. By 1843 the whole of the keel and the bottom timbers had been raised and the site was declared clear. Refloating of a 200-foot barge at the port of Tampa Florida. "Salvors" are seamen and engineers who carry out salvage to vessels that they do not own, and who are not members of the vessel's original crew. When salving large ships, they may use cranes, floating dry docks and divers to lift and repair submerged or grounded ships, preparing them to be towed by a tugboat. The goal of the salvage may be to repair the vessel at a harbour or dry dock, or to clear a channel for navigation. Salvage operations may also aim to prevent pollution or damage to the marine environment. Additionally, the vessel or valuable parts of the vessel or its cargo may be recovered for resale, or for scrap. The term harbour salvage refers to the salvage of vessels stranded or sunk in sheltered waters. Such vessels are not normally subject to the same deterioration caused by marine and weather conditions as offshore salvage vessels are. In addition, unless the vessel to be salvaged is obstructing navigation, then there is no need to work as swiftly as in offshore salvage. Also, harbour pre-salvage survey and planning stages tend to be less time consuming and environmentally dependent. It is also easier to gain access to local labour resources and heavy equipment such as floating cranes and barges. Saving the cargo and equipment aboard a vessel may be of higher priority than saving the vessel itself. The cargo may pose an environmental hazard or may include expensive materials such as machinery or precious metals. In this form of salvage, the main focus is on the rapid removal of goods and may include deliberate dissection, disassembly or destruction of the hull. Wreck removal focuses on the removal of hazardous or unsightly wrecks that have little or no salvage value. Because the objectives here are not to save the vessel, the wrecks are usually refloated or removed by the cheapest and most practical method possible. In many cases, hazardous materials must be removed prior to disposing of the wreck. 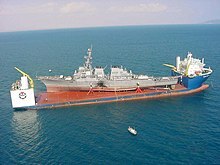 The most common techniques used in wreck removal are cutting the hull into easily handled sections or refloating the vessel and scuttling it in deeper waters. The salvage of a vessel that is damaged but still afloat is called afloat salvage. This type of salvage is mostly unobtrusive and involves primarily damage control work such as hull welding, stabilization (rebalancing ballast tanks and shifting cargo) and structural bracing. In some cases, the vessel can remain underway with little disruption to its original purpose and crew. Clearance salvage is the coordinated removal or salvage of numerous vessels in a harbor or waterway. It typically follows a catastrophic event such as a tsunami, hurricane or an act of war (e.g. Pearl Harbor). There may be multiple vessel obstructions with varying degrees of damage due to collision, fire or explosions. Salvage projects may vary with respect to urgency and cost considerations. When the vessel to be returned to service is commercial, the salvage operation is typically driven by its commercial value and impact on navigational waterways. Military vessels on the other hand are often salvaged at any cost—even to exceed their operational value—because of national prestige and anti-"abandonment" policies. Another consideration may be loss of revenue and service or the cost of the space the vessel occupies. USS Regulus hard aground in 1971 due to a typhoon: after three weeks of effort, Naval salvors deemed it unsalvageable. In contract salvage the owner of the property and salvor enter into a salvage contract prior to the commencement of salvage operations and the amount that the salvor is paid is determined by the contract. This can be a fixed amount, based on a "time and materials" basis, or any other terms that both parties agree to. The contract may also state that payment is only due if the salvage operation is successful (a.k.a. "No Cure, No Pay"), or that payment is due even if the operation is not successful. By far the commonest single form of salvage contract internationally is Lloyd's Standard Form of Salvage Agreement (2011), an English law arbitration agreement administered by the Council of Lloyd's, London. In the United States, in pure salvage (also called "merit salvage"), there is no contract between the owner of the goods and the salvor. The relationship is one which is implied by law. The salvor of property under pure salvage must bring his claim for salvage in a court which has jurisdiction, and this will award salvage based upon the "merit" of the service and the value of the salvaged property. Pure salvage claims are divided into "high-order" and "low-order" salvage. In high-order salvage, the salvor exposes himself and his crew to the risk of injury and loss or damage to his equipment in order to salvage the property that is in peril. Examples of high-order salvage are boarding a sinking ship in heavy weather, boarding a ship which is on fire, raising a ship, plane, or other sunken property, or towing a ship which is in the surf away from the shore. Low-order salvage occurs where the salvor is exposed to little or no personal risk. Examples of low-order salvage include towing another vessel in calm seas, supplying a vessel with fuel, or pulling a vessel off a sand bar. Salvors performing high order salvage receive substantially greater salvage award than those performing low order salvage. In order for a claim to be awarded three requirements must be met: The property must be in peril, the services must be rendered voluntarily (no duty to act), and finally the salvage must be successful in whole or in part. There are several factors that would be considered by a court in establishing the amount of the salvor’s award. Some of these include the difficulty of the operation, the risk involved to the salvor, the value of the property saved, the degree of danger to which the property was exposed, and the potential environmental impacts. It would be a rare case in which the salvage award would be greater than 50 percent of the value of the property salvaged. More commonly, salvage awards amount to 10 percent to 25 percent of the value of the property. Private boat owners, to protect themselves from salvage laws in the event of a rescue, would be wise to clarify with their rescuer if the operation is to be considered salvage, or simply assistance towing. If this is not done, the boat owner may be shocked to discover that the rescuer may be eligible for a substantial salvage award, and a lien may be placed on the vessel if it is not paid. Several navies have Rescue Salvage vessels which are to support their fleet and to come to the aid of vessels in distress. In addition they may have Deep Salvage Units. 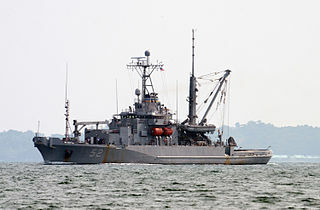 A DSU (salvage) is an attached unit to the US Navy . Technical diving marine salvage units which can operate in depths unworkable by civilian divers, and which requires saturation diving or trimix (breathing gas) diving techniques. This type of unit is at times formed by a commercial diving company contracting to government via the Baltic Exchange. When certain vessels are lost in an unknown area, a potential salvor might discover and plunder the wreck without knowledge of the wreck's owner. Salvaging a foreign navy's vessel is against international law. At the height of the Cold War the United States raised a portion of Soviet submarine K-129 in the Western Pacific Ocean. The CIA, who conducted the salvage under the guise of "mining the seafloor for manganese nodules" with a commercial vessel, spent over $800 million (1974 dollars) on the clandestine operation now known as Project Azorian. Salvage law has as a basis that a salvor should be rewarded for risking his or her life and property to rescue the property of another from peril. Salvage law is in some ways similar to the wartime law of prize, the capture, condemnation and sale of a vessel and its cargo as a spoil of war, insofar as both compensate the salvor/captors for risking life and property. The two areas of law may dovetail. For instance, a vessel taken as a prize, then recaptured by friendly forces on its way to the prize adjudication, is not deemed a prize of the rescuers (title merely reverts to the original owner). But the rescuing vessel is entitled to a claim for salvage. Likewise a vessel found badly damaged, abandoned and adrift after enemy fire disabled her does not become a prize of a rescuing friendly vessel, but the rescuers may claim salvage. A vessel is considered in peril if it is in danger or could become in danger. Examples of a vessel in peril are when it is aground or in danger of going aground. Prior to a salvage attempt the salvor receives permission from the owner or the master to assist the vessel. If the vessel is abandoned no permission is needed. The amount of the award depends on, in part, the value of the salved vessel, the degree of risk involved and the degree of peril the vessel was in. Legal disputes do arise from the claiming of salvage rights. To reduce the amount of a claim after an accident, boat owners or skippers often remain on board and in command of the vessel; they do everything possible to minimise further loss and seek to minimize the degree of risk the vessel is in. If another vessel offers a tow and the master or owner negotiates an hourly rate before accepting then salvage does not apply. Some maritime rescue organisations, such as Britain's Royal National Lifeboat Institution, do not insist the crews of their lifeboats renounce their right to claim compensation for salvage., but should they choose to make a claim, they must pay for the use of the lifeboat and make good any damage suffered by her. Claims for salvage by lifeboat crews are rare. Jetsam are goods that were thrown off a ship, which was in danger, to save the ship. Flotsam are goods that floated off the ship while it was in danger or when it sank. Ligan or lagan are goods left in the sea on the wreck or tied to a buoy so that they can be recovered later by the owners. Derelict is abandoned vessels or cargo. In the United Kingdom under the Merchant Shipping Act 1995, jetsam, flotsam, lagan and all other cargo and wreckage remain the property of their original owners. Anyone, including recreational divers and beachcombers, removing those goods must inform the Receiver of Wreck to avoid the accusation of theft. As the leisure activity of wreck diving is common, there are laws to protect historic wrecks of archaeological importance and the Protection of Military Remains Act 1986 protects ships and aircraft that are the last resting place of the remains of members of the armed forces. The 1910 Brussels Convention for the Unification of Certain Rules with Respect to Assistance and Salvage at Sea reflects the traditional legal principles of marine salvage. The 1989 International Convention on Salvage incorporated the essential provisions of the 1910 Convention, and added some new provisions besides. The 1989 Salvage Convention entered force on 14 July 1996 with nearly twenty parties in agreement. For states which are parties to both conventions, the 1989 Convention takes precedence over the 1910 one where their provisions are mutually incompatible. The largest marine salvage operation on record was the raising of the German High Seas Fleet which was scuttled at Scapa Flow in 1919. Between 1922 and 1939, 45 of the 52 warships sunk, including six battleships, five battlecruisers, five cruisers and 32 destroyers were raised from the bottom of the flow at depths of up to 45 metres, primarily by Cox & Danks Ltd & Metal Industries Ltd, and broken up for scrap. The harbor clearance and ship recovery after the attack on Pearl Harbor. USS California and USS West Virginia, resting on the bottom of Pearl Harbor on 7 December 1941, were refloated and repaired. They were key participants in the Battle of Surigao Strait in October 1944. The Swedish 17th-century warship Vasa was raised in April 1961. She had lain on the bottom of Stockholm harbor since her capsizing on her maiden voyage in 1628. The raising and subsequent conservation of Mary Rose, the flagship of the navy of King Henry VIII, which sank in 1545 in the Solent, North of the Isle of Wight. As with Vasa, the salvage of Mary Rose in 1982 was an operation of immense complexity and was a major achievement in marine archaeology. The remains of the ship, together with recovered weapons, sailing equipment and crew’s personal effects are now on display at Portsmouth Historic Dockyard and the nearby Mary Rose Museum. In 1943-44 a famous Great Lakes salvage engineer, Capt. 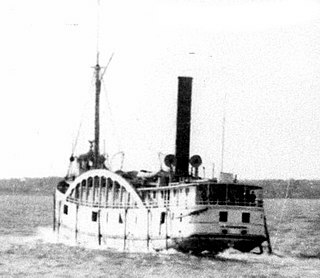 John Roen, did what was considered financially impossible and salvaged SS George M. Humphrey, which sank in a collision in 77 feet (23 m) of water in the Straits of Mackinac, by first removing the ore it was carrying and then using two vessels on each side of the underwater wreck, with cables that "walked" George M. Humphrey in stages underwater (reducing the weight drastically) to shallower water where it was then pumped out and re-floated and towed out. Some of the techniques developed by Roen for the salvage of George M. Humphrey established methods which became new standards for future salvages, where before many wrecks were considered too heavy and large to salvage. In 1968 Shipwrecks Inc., headed by E. Lee Spence, was granted South Carolina State Salvage License #1 to salvage the wreck of the American Civil War blockade runner SS Georgiana under that state's new underwater antiquities act, which had been drafted and passed at the instigation of Spence, who had discovered the wreck in 1965. Spence's work on the wreck was some of the very first underwater archaeology done in the United States. Spence and his crew raised over 1,000,000 individual artifacts, conservatively valued at over $12,000,000. The artifacts fell into three basic groups: medicines, munitions and merchandise. They ranged from tiny brass sewing pins and glass buttons to heavy iron cannons and included such things as cannonballs; bullets; bottles; pottery; carved bone toothbrushes; pencils; match cases; and Wedgwood china. In 1974 the U.S. CIA attempted to recover the sunken Soviet Golf-class submarine K-129 in the secret and expensive intelligence operation Project Azorian. The attempt was only partially successful. Nuestra Señora de Atocha was discovered in 1985 with recovered gold and other artifacts worth an estimated $400 million USD. Vrouw Maria was discovered in 1999, and after a protracted legal battle, plans for salvage are still in the discussion and planning stage. It is known to contain priceless works of art. The search for the wreckage and flight data recorders of South African Airways Flight 295 is at 16,000 feet (4,900 m) the deepest successful marine salvage operation to date. On 12 August 2000, the Russian Oscar-class submarine Kursk sank in the Barents Sea following an internal explosion, leading to the death of 118 sailors and officers. A portion of the destroyed submarine was raised to the surface in late 2001 to recover the bodies and eliminate the hazard from Kursk's two nuclear reactors. USS Cole was severely damaged in October 2000 by terrorists while it was harbored in the Yemeni port of Aden. It was rescued, salvaged, and repaired to serve again. In July 2002, HMS Nottingham suffered serious damage due to a navigational error, striking Wolf Rock near Lord Howe Island. She was towed, stern first to Newcastle, New South Wales in August 2002 for minor repairs and was consequently returned to the United Kingdom aboard the heavy lifting vessel MV Swan. In July 2006, the Japanese car carrier Cougar Ace, packed with 4,700 Mazda cars and Isuzu trucks bound for the North American market, was traveling from Japan to Vancouver, British Columbia, when it stranded in the Pacific Ocean. The ship’s condition quickly began to deteriorate as it took on water. The salvage team involved had to work solidly for 24 days straight to try and save the vessel and its extremely lucrative cargo. In May 2007, Odyssey Marine Exploration undertook the Black Swan Project and recovered an estimated $500 million USD in silver and gold coins from a shipwreck in the Atlantic Ocean. However, the wreck and its contents were claimed by the Spanish government. A legal dispute through United States Federal Courts was resolved in February 2012, when it was reported that U.S. Magistrate Judge Mark Pizzo had ordered Odyssey to return the coins to Spain by February 24, 2012 for dispersal to museums, not to heirs. The Supreme Court declined to stay this order and Odyssey has agreed to abide by the decision. ^ Li Li (25 August 2011). China's Cultural Relics. Cambridge University Press. pp. 32–33. ISBN 978-0-521-18656-8. ^ Needham (1986), Volume 4, Part 1, 40. ^ Needham (1986), Volume 4, Part 1, 39. ^ a b Needham (1986), Volume 4, Part 1, 40–41. ^ Needham (1986), Volume 4, Part 1, 41. ^ Needham (1986), Volume 4, Part 1, 40–. ^ Richardson J (January 1991). "Abstract of the case of a diver employed on the wreck of the Royal George, who was injured by the bursting of the air-pipe of the diving apparatus. 1842". Undersea Biomed Res. 18 (1): 63–4. PMID 2021022. Retrieved 2008-06-19. ^ The Times, London, article CS117993292 dated 12 Oct 1840, retrieved 30 Apr 2004. ^ Percy, Sholto (1843). Iron: An Illustrated Weekly Journal for Iron and Steel Manufacturers. 39. Knight and Lacey. ^ Pixa, Rand R. "In Defense of Perpetual Title to Sovereign Wrecks". DEPARTMENT OF THE NAVY -- NAVAL HISTORY & HERITAGE COMMAND UNDERWATER ARCHAEOLOGY BRANCH. Retrieved 21 March 2014. ^ Grotius, De Iure Praedae Commentarius (On the Law of Prize and Booty)(Oxford: Oxford University Press 1950) p. 164(stating the purpose of Italian prize law is to compensate for the expense incurred, risk taken, and labor performed). ^ Upton, Maritime Warfare and Prize (New York: John Voorhies Law Bookseller and Publisher, 1863) p. 234-35 (discussing doctrine of postliminium and salvage of recaptured vessels). ^ The Mary Ford, reprinted in James Scott Brown (ed. ), Prize Cases Decided in the United States Supreme Court (Oxford: Clarendon Press 1923) p. 130(seminal 1796 decision on the law of salvage that American rescuers who found a wrecked and abandoned French vessel adrift without sails or rigging could not condemn her as a prize, but were entitled as salvors to the judge's estimate of fair compensation based on time lost, labor, risk taken, and mental and physical suffering--to induce mariners to undertake the peril and expense of rescue at sea). ^ "Fishing For A Million" Popular Mechanics, December 1944, pp. 01-04. ^ Steven S. Zumdahl; Donald J. DeCoste (2013). Chemical Principles, 7th ed. p. 505. ^ "No sign of Air France flight recorders as search ends". CNN. 2009-08-20. Retrieved 20 August 2009. ^ Joshua Davis (2008-02-25). "High Tech Cowboys of the Deep Seas: The Race to Save the Cougar Ace". Wired Magazine. Retrieved 2009-10-17. ^ "Sunken treasure headed back to Spain". Reuters. Gores, Joseph N. (1971), Marine Salvage: The Unforgiving Business of No Cure, No Pay, Garden City, NY, US: Doubleday, OCLC 136301. Preface by Willard Bascom. Madsen, Daniel (2003), Resurrection: Salvaging the Battle Fleet at Pearl Harbor, US Naval Institute Press, ISBN 978-1-55750-488-3. Milwee, William (1996), Modern Marine Salvage, Cornell Maritime Press. Tew, Ian (2007), Salvage, A personal odyssey, Seafarer Books, Sheridan House. Wikimedia Commons has media related to Salvage. 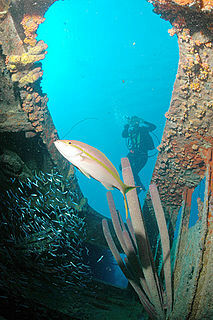 Wreck diving is recreational diving where the wreckage of ships, aircraft and other artificial structures are explored. Although most wreck dive sites are at shipwrecks, there is an increasing trend to scuttle retired ships to create artificial reef sites. Diving to crashed aircraft can also be considered wreck diving. The recreation of wreck diving makes no distinction as to how the vessel ended up on the bottom. In maritime law, flotsam, jetsam, lagan, and derelict are specific kinds of shipwreck. The words have specific nautical meanings, with legal consequences in the law of admiralty and marine salvage. A shipwreck is defined as the remains of a ship that has been wrecked—a destroyed ship at sea, whether it be sunken or floating on the surface of the water. A salvage tug is a specialized type of tugboat which is used to rescue ships which are in distress or in danger of sinking, or to salvage ships which have already sunk or run aground. USNS Salvor (ARS-52) is a Safeguard-class salvage ship, the second United States Navy ship of that name. The archaeology of shipwrecks is the field of Archaeology specialized most commonly in the study and exploration of shipwrecks. Its techniques combine those of archaeology with those of diving to become Underwater archaeology. However, shipwrecks are discovered on what have become terrestrial sites. HMS Reclaim was a deep diving and submarine rescue vessel of the British Royal Navy. She was originally intended to be the King Salvor-class ocean salvage vessel Salverdant and was fitted with specialised equipment including underwater television cameras and sonar and echosounding apparatus. She was also equipped for submarine rescue work. SS Comet was a steamship that operated on the Great Lakes. Comet was built in 1857 as a wooden-hulled propeller-driven cargo vessel that was soon adapted to carry passengers. She suffered a series of maritime accidents prior to her final sinking in 1875 causing the loss of ten lives. She became known as the only treasure ship of Lake Superior because she carried 70 tons of Montana silver ore when she sank. The first attempts to salvage her cargo in 1876 and 1938 were unsuccessful. Comet was finally salvaged in the 1980s when the Great Lakes Shipwreck Historical Society illegally removed artifacts from the wreck. The artifacts are now the property of the State of Michigan and are on display as a loan to the Great Lakes Shipwreck Museum. The fate of her silver ore cargo is unknown. Comet's wreck is now protected by the Whitefish Point Underwater Preserve as part of an underwater museum. The John M Osborn was a wooden steam barge that sank in Lake Superior in 1884 with the loss of five lives. The Osborn was just 2 years old when the larger, steel-hulled Alberta, which was called a "steel monster" and "terror of the lakes", rammed her. The wreck of the Osborn was discovered 100 years after her sinking. The wreck was illegally salvaged in the 1980s. Many of Osborn's artifacts became the property of the State of Michigan after they were seized from Great Lakes Shipwreck Museum. The State allows the museum to display the artifacts as a loan. The wreck of the Osborn is now protected by the Whitefish Point Underwater Preserve as part of an underwater museum. 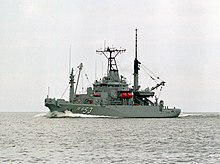 USNS Grasp (T-ARS-51) is a Safeguard-class salvage ship, the second United States Navy ship of that name.